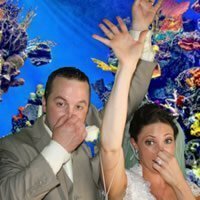 “A memory your guest can take home” A photo booth is FUNtastic entertainment for your wedding reception with a perfect party favor!! Fully Customizable photo strips. You can choose the boarder, logo, and up to four backgrounds on one strip. Our photo booths fit up to 10 people at a time and every guest at your wedding will get a copy of every photo they are in and you also get a copy in your scrapbook with special messages from your guests. UNLIMITED high resolution, instant photos for one great low rate. Call or email us for more information and to check for availability of your special day. Call us today about our specials.